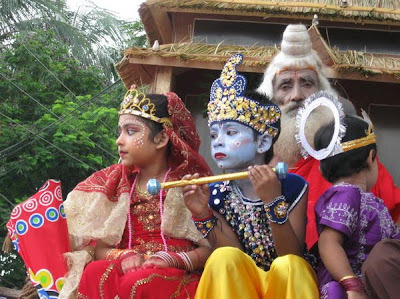 Today is celebrated as Janmashtami (literally means Birth on the 8th), the blessed birthday of Krishna here in Bangladesh, as it is in India. According to Hindu legend Lord Krishna took birth at midnight on the 'ashtami' or the 8th day of the 'krishnapaksha' or dark fortnight in the month of Shravan (August-September). 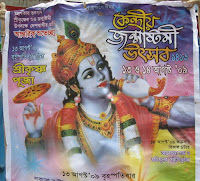 Here in my own city Dhaka, Janmashtami is a very traditional festival. From about 400 years since this city is established, the occasion of the holy birth of Krishna is celebrated in great enthusiasm. 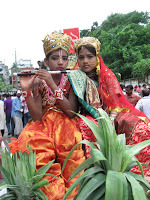 Dhaka which was predominantly a city inhabited by hindus even only about 100 years ago, Janmashtami was among the top three religious celebration, the other two being Muslim festivals such as Eid and Muharram. 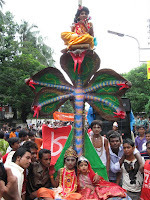 Traditionally the hindu community in Dhaka celebrates the Janmashtami with long parades / marches accompanied by chants, music and festive mood along the city roads. I was lucky to observe one today which started from the Dhakeshwari Temple, not so far from where I live. The parade was more than a mile long. People of all age came to participate. All kind of vehicles were decorated for the occasion. Thanks to loud speakers almost all vehicles tried to play their own Krishna songs and chants to attract others. Today I saw Krishna so many times that I lost count eventually. 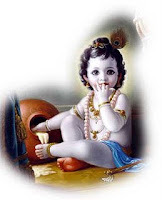 From baby Krishna to all grown up Krishna! Darshan after Darshan! What is most striking feature of Janmashtami Parade is the custom of dressing up as Krishna, Radha and other characters from the life of Krishna. And ofcourse all of them had the famous flute in hand, the favorite instrument of Krishna. Many colored themselves in blue to represent the dark complexion of Krishna. It is no doubt one of the most colorful religious festival you can imagine. People of every social class come and join to celebrate here thanks to the occasion. Apart from walking on foot - horse carts, open trucks, van and all kind of vehicles get filled with Krishna devotee who join the parade. Hazrat Inayat Khan point out two important aspects of Krishna's life whom he sees as a perfect man (Insan Kamil). The two aspect which offers wisdom from Krishna's blessed life is the aspect of perfecting the art of war in life, as life is a continual battle and the earth is the battlefield where every soul has to struggle, and the one who wants to win the kingdom of the earth must be well acquainted with the laws of warfare. He has to fight on two fronts at the same time: one enemy is himself (nafs, ego's falsehood), and the other is before him (dunya, the external world of distractions). If he is successful on one front and fails on the other front, then his success is not complete. The other aspect of Krishna's life shows that every soul is striving to attain God – not God, as Judge or King, but as the Beloved. Every soul seeks God, the God of love, in the form it is capable of imagining, and thus the story of Krishna and the Gopis signifies God and the various souls seeking perfection. The path of Krishna is the path of pure devotion and sweet surrender. God speaks thru Krishna in which the whole of his teachings are summarized in the following verses: "Always think of Me, become My devotee, offer obeisances to Me, and worship Me. Being completely absorbed in Me, surely you will come to Me." Shaykh Faraz Rabbani, a Sunni Path scholar, wrote in the context of the possible prophethood of Sri Krishna, Gautam Buddha and Confucius “It is very probable that many of the great religious figures of other traditions were true prophets”. Mazhar Jan-i-Jana, an eighteenth century theologian and mystic, regarded both Sri Krishna and Sri Ram as Prophets of God and Vedas as divinely inspired. The same we can say of Maulana Hasrat Mohani’s thoughts (who was a Deobandi scholar and a member of India’s constituent assembly). Also some ulama in the famous Firangi Mahal of Lucknow held Sri Krishna in great respect. It claims that Prophet Muhammad said “Kanna filhindhi nabiyyun asvadhul lavni ismuhoo Kahina” meaning “A Prophet appeared in India. He was black in complexion. His name was Kahina”. This is reported to be mentioned in the book ‘Firdowsul Akbar’ by Hazrat Thylami. If this is true, which I could not find a way of ascertaining, it quite clearly mentions about Sri Krishna who had a dark complexion and was in his childhood lovingly called kanha.